Mix the dip ingredients together until combined. Set aside in the fridge. Cut the peppers into 1/2-inch thick rounds. Dust the peppers with Bisquick™ and shake off the excess. Mix the 1 1/2 cups of Bisquick™ with the beer. Don't use all the beer at first, use most and stir it to see the consistency. You want it to be a thin version of pancake batter. If it's too thick, add some more beer. Preheat frying oil to 325°F. Dip the rings into the batter in batches of 5 or so, then get them right into the hot oil. Cook the rings for about 3-5 minutes until brown and crispy. Onions aren't the only food that is naturally ring-shaped! Why do we treat them like they are? While I don’t think onions will ever be dethroned as the king of the ring, these peppers packed a lot of unique flavor and had me excited for each bite. I just chopped up the rings and treated them like I would onion rings – some seasoning, a quick dip in Bisquick tempura, and fried ‘em up. 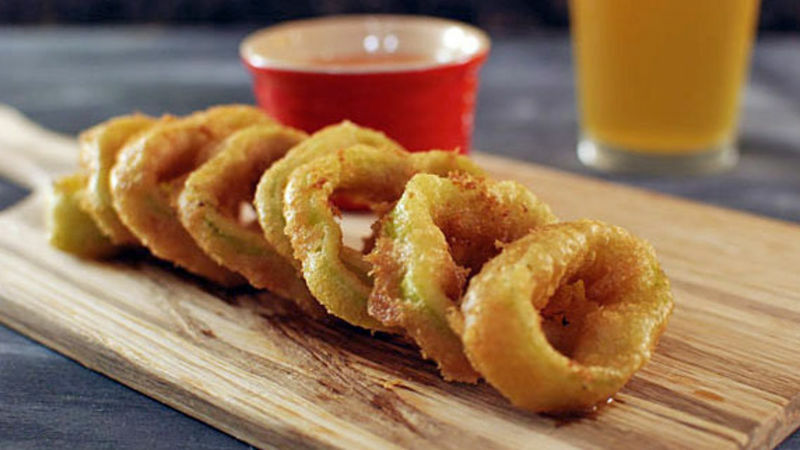 Next time you plan on making onion rings, try these Crispy Pepper Rings instead! You wont be disappointed. First, cut the peppers into equal 1/2-inch rings. A quick batter...just add beer! Lightly coat with the Bisquick to help the batter stick. A quick dip in the hot tub. Lightly salt and allow to dry. These are crunchy and even more flavorful than onion rings. The horseradish sauce is zippy and tangy and really takes the peppers to the next level! Dan Whalen wonders what else he can make rings out of. He has been blogging for over 4 years at The Food in My Beard; check Dan's Tablespoon profile often to try his recipes with creative international spins!